Valentine’s Day is next Friday and its the kickoff to President’s Day weekend. What better way to celebrate your someone special or your favorite founding father than with some super cute jello shots! Pistachio pudding and a generous dose of vodka comprise the stem of the cherry shaped jello shot which is topped off with a red maraschino cherry. The resulting flavor is sweet and creamy, with a little boozy boost. In a bowl, sprinkle unflavored gelatin over 1/2 cup of the cold water and allow the gelatin to absorb the water. Stir in 1/2 cup of the boiling water until gelatin is fully dissolved. Whisk in the pudding until dissolved. Whisk in the milk, followed by the vodka. Gently spoon into a 8 inch round (or equivalent) cake pan until it is the depth of the cookie cutter (about 1/2 inch). Refrigerate until firm. Dip the pan in warm water for 15 seconds to loosen the gelatin from the pan. 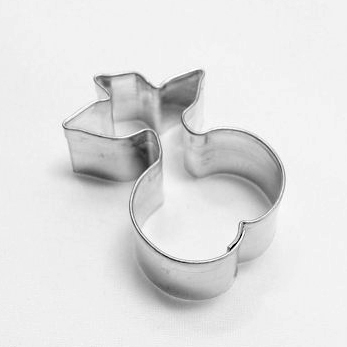 Use a small Mini Cherries Cookie Cutter to cut the cherry shapes. Gently lift onto a plate or cookie sheet. Garnish with Maraschino cherry halves and serve.